Red Reflet Ranch in Ten Sleep, Wyo., is a ranch for the senses. With recreational offerings, organic gourmet cuisine and year-round luxury cabins, guests can savour exclusive experiences surrounded by breathtaking scenery — we’re talking rock climbs and cattle drives set against coral-coloured sandstone cliffs and the snow-capped peaks of Bighorn National Forest. Rates at the all-inclusive, year-round working ranch and luxury resort start at $530 (U.S.) per person, per night. Since Red Reflet is also a working ranch, all guests are welcome to help out with the cattle work that needs to be done on the property. 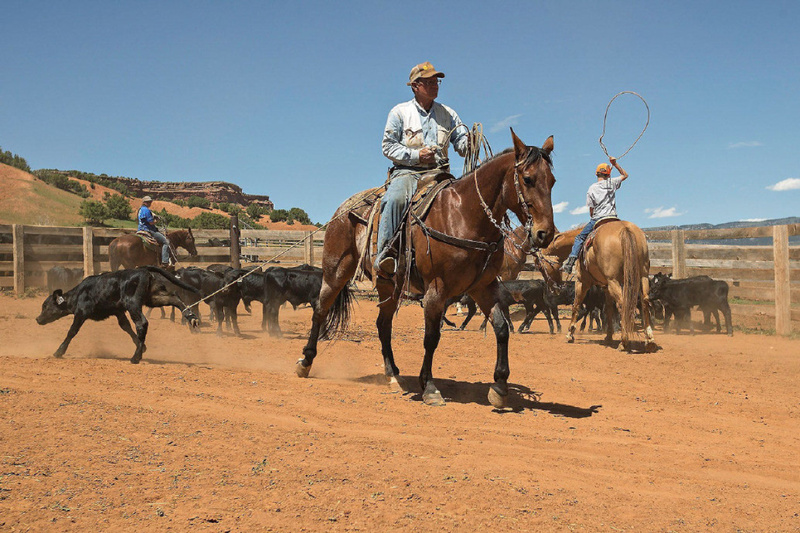 From cattle drives to gathering and branding, there are plenty of opportunities for guests to get outdoors and experience the true western lifestyle, including riding with the wranglers to look after the herd. With nearly every ingredient grown or raised on the ranch, mealtime is a memorable occasion. Gourmet dishes are made with produce from the orchard, garden or greenhouse, as well as organic, free-range chicken and eggs. The ranch and surrounding area also has abundant beef, elk, deer, grouse, rabbit, pheasant and antelope, so meals often include wild game. Guests can schedule an open kitchen invitation to meet the resident chef, learn a few cooking techniques and help prepare the next meal. The natural waterpark on the property is fed by an artesian well, which comes up from the ground to keep the water in the ponds a refreshing 25 C. The waterpark is the perfect spot to cool off on a hot day after exploring the surrounding 10,927 hectares on an ATV or dirt bike. A canoe, waterslide, sandy beach and giant rope swing keep swim time interesting, and adventurous types can zip line directly into the water. Red Reflet has its own artificial rock wall but there are also several exceptional climbing sites in the area that are suitable for amateur hikers and mountaineers who are comfortable with challenging to moderately difficult climbs. Guests should bring a pair of good rock-climbing shoes and get in a few practice climbs at the resort before venturing out on their own — they’ll be rewarded with unbeatable views of Ten Sleep Canyon. Guests at Red Reflet enjoy five-star lodging, including 1,400-1,850-sq.-ft. private chalets. Built like homes with incredible views and luxurious living spaces, each chalet offers modern comfort and convenience. Large groups and families will like the Ranch House, which sleeps up to 14 people and features a large yard, pond and tree house. Smaller groups should book the Ponds Chalet, which is at the entrance of a red rim canyon, with dramatic views day or night.